Posted on March 16, 2017 at 11:45 am. Institutional memory. Continuity and stability. Leaders and mentors. 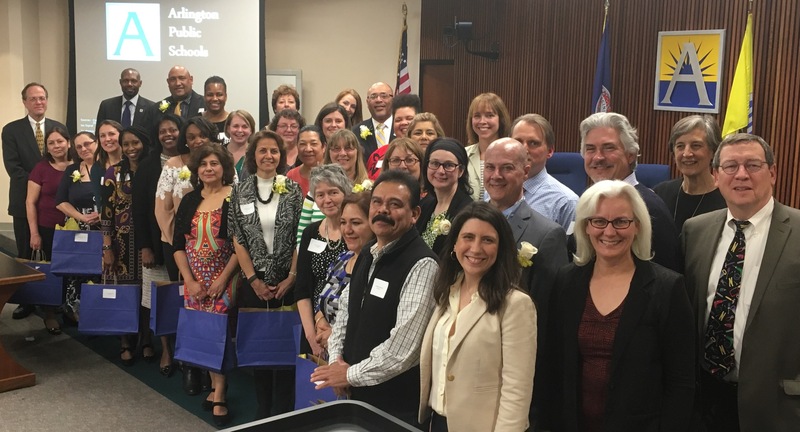 These are just a few of the ways that this group of 169 employees are crucial to the success of the Arlington Public Schools. 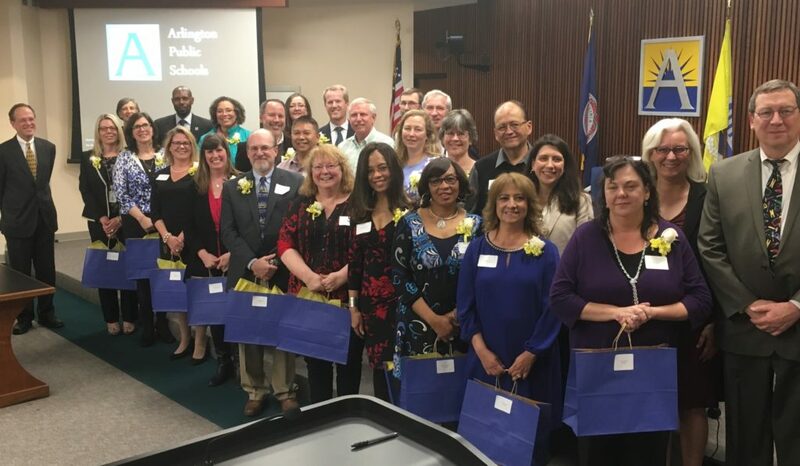 This year’s Service Awards honorees have served a combined total of 4,035 years at APS and were recognized by their colleagues and the School Board at the March 9 meeting. 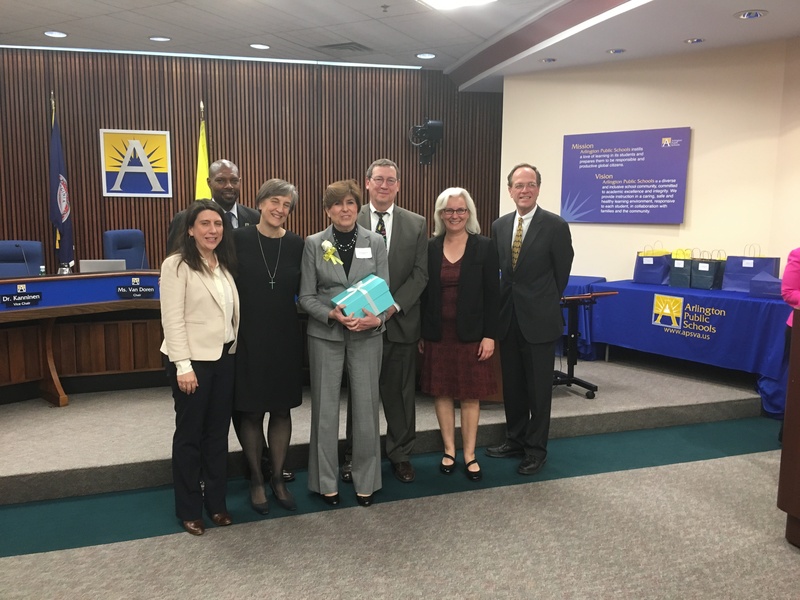 This year, the School Board honored Long Branch Principal Felicia Russo for her 40 years of service to Arlington Public Schools, and presented her with a Tiffany vase to commemorate her many devoted years of service. She received a lengthy standing ovation from her many colleagues, friends, and community members who were there to celebrate this milestone in her career. Congratulations Felicia! 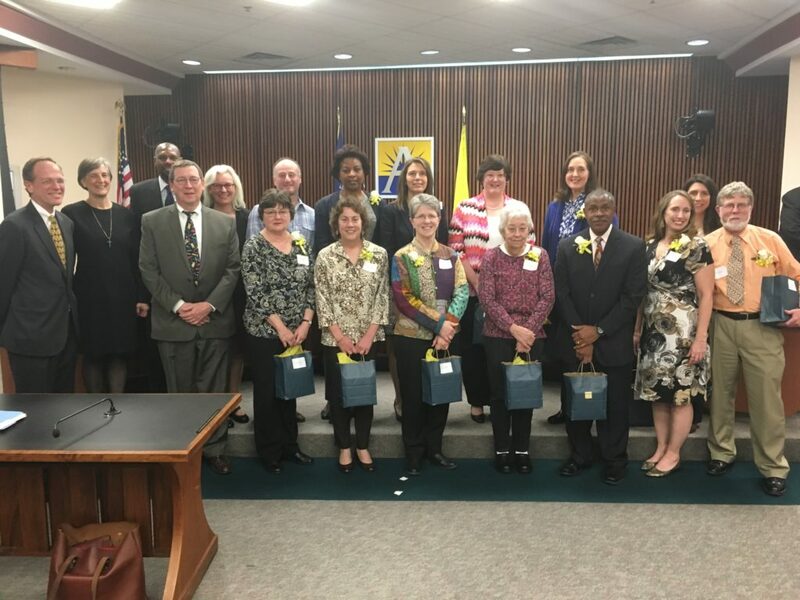 Dozens of other APS employees were recognized for career milestones of 20, 25, 30, and 35 years of service to the school division. Each group was called up as historical facts and cultural highlights were shared about their first year at APS, including the average salary, cost of a new home, news headlines, and popular songs and movies. It was a night filled with celebration, laughter, and smiles as each person was honored for their dedication to APS. Congratulations to all! 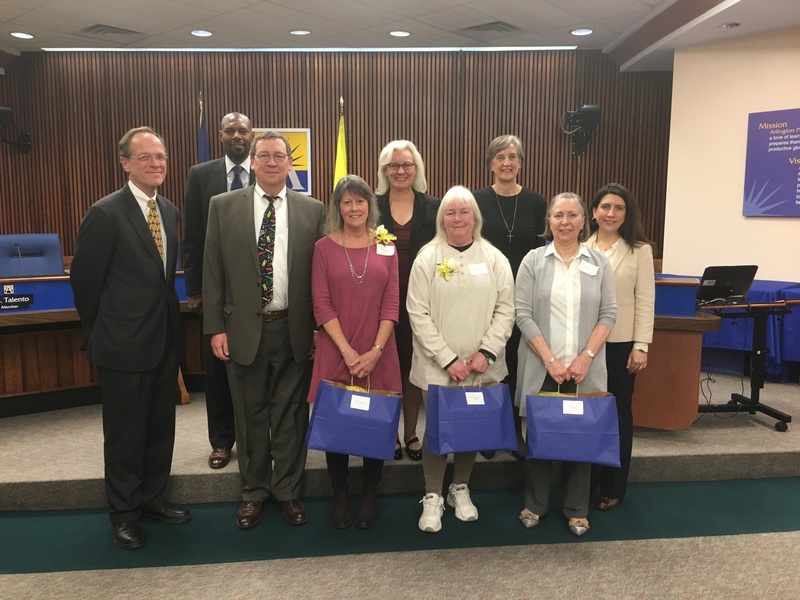 20 Years: Ana Aguirre, Barrett; Heather Akpata, Kenmore; Oswaldo Barahona, Facilities & Operations; Thomas Bea, Kenmore;Jamie Borg, Glebe; Krista Bouton, Barcroft; Kelly Breedlove, -Arts Education; Denise Brown, Barcroft; Patricia Carlson, Williamsburg; Maria Castro, Washington-Lee; Debra Cave, Yorktown; Michael Clark, Williamsburg; Kathryn Clingenpeel, Information Services; Claudia Collins, Wakefield; Susana Cordova, Carlin Springs; Consuelo Dawood, Taylor; Fred Delventhal, Barrett; Jeanne Denning, Key; Bridgett Doles, Information Systems; Rosemary Duenas, Hoffman-Boston; Patricia Duran, Nottingham, Jeffrey Elkner, Career Center; Jean Flemming, Yorktown; Jennifer Flores, Barrett;Sharmane Franklin, Abingdon; Wanda Gant, Human Resources; Toni Gelston, Barcroft; Leon Gibbs, Kenmore; Allison Gordon, Ashlawn; Richard Hoffmann, Transportation; Alvaro Hondoy, Langston; Christopher Jorss, Information Services; Nancy Kauffunger, Jamestown; Gail Klein, Taylor; Philip Krauth, Washington-Lee; Zuleyka Le Maitre, Key; Anthony Lee, Career Center; Geoconda Loza, Dept. of Instruction; Juana Luna, LSRC; Mary Madden, Wakefield; Someth May, Transportation; Marcus McKinney, Wakefield; Ana Ruth Mejia, Jefferson; Tara Mitchell, Long Branch; Aundrea Moore, Ashlawn; Robert Moore, Transportation; Lisa Murphy, Williamsburg; Nancy Musser, Career Center; Michael Musto; Jefferson; Jeana Norton, Washington-Lee; Barbara Papantoniou, Hoffman-Boston; Ray Pasi, Yorktown; Virginia Pereira, plant Operations Services; Lisa Powell, Thomas Jefferson Community Center; Terance Proctor, Information Services; Laura Reichenbaugh, Randolph; Betty-Lu Reid, Barcroft; Melida Reyes, Career Center; Rachel Sadauskas, Yorktown; Anna Samayoa, Benefits & Payroll Services; Betty Sanders, Wakefield; Kenwyn Schaffner, Jamestown; Teresa Short, Arlington Science Focus; Marel Sitron, Barcroft; Clennetta Smith, Transportation; David Soles, H-B Woodlawn Secondary Program; Sharon Sterling, Special Education; Leslie Stockton, Kenmore; Monica Stroik, Taylor; Monica Sugaray, LSRC; Karen Sutherland, Campbell; Marbea Tammaro, Special Education; Mary Tawiah, Campbell; Malcolm Tronic, Randolph; Wade Turner, Campbell; Robert Tuttle, Williamsburg; Erin Wales-Smith, Human Resources; Anita Warner, Wakefield; Catherine Wilkes, Swanson; Andrew Wojciechowski, Abingdon; Tricia Zipfel, Nottingham.